“Married, and then quickly divorced 4 women to allow them to circumvent strict property laws which seek to cool prices in China’s booming cities, and pocketed more than £8000 ($10k) from each transaction. Once the paperwork is put through, Wang applies for a divorce and puts himself on the market again”. 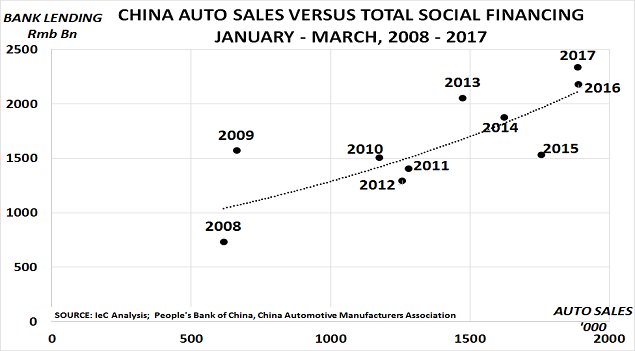 A collective delusion has swept China’s Tier 1 cities, just as happened in the USA during the sub-prime bubble. Amazingly, China’s property bubble is even larger than sub-prime. Unremarkable pieces of land in Shanghai are now being sold at $2000/sq foot ($21500/sq metre), nearly 3 times the average land price in Manhattan, New York. “It is also easy to forget that housing was all state-owned until 1998, and still is in most rural areas. Urban housing was built and allocated by the state – and there wasn’t even a word for “mortgage” in the Chinese language. Not only have home-buyers never lived through a major house price collapse, they have also had few other places to invest their money”. China’s GDP was only $11.2tn last year, meaning that its property sector loans are more than 2/3rds of GDP. The problem is that everyone loves a bubble while it lasts. And so, as in the US during subprime, most analysts are keen to argue that “everything is fine, nothing to worry about here”. The problem, of course, as the second chart shows, is that this is also not true. 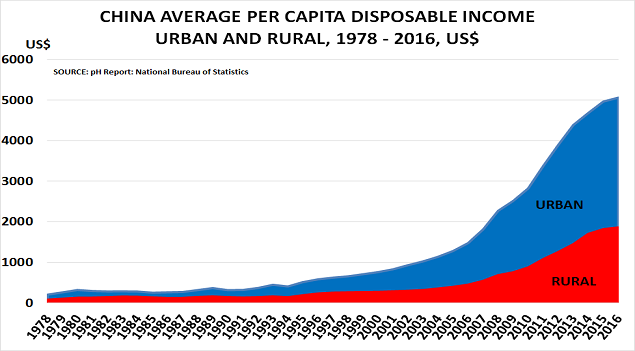 Annual disposable income for city-dwellers averaged just $5061 last year, whilst in rural areas it averaged only $1861. You really don’t buy many homes or cars with that level of income, unless a massive lending bubble is underway. And this is why fear is the right emotion for everyone outside China. Its lending bubble has driven the “recovery” in global growth since 2009 – pushing up values of everything from homes to oil prices. So anyone who remembers the end of the US subprime bubble should be very scared about what could happen when – not if – China’s bubble bursts. The best view is always from the top of the mountain. That’s probably why the outlook seems so promising for US auto and housing markets. Both appear to be doing well on the surface, but dig a little deeper and concerns soon emerge. Back in July, there was already reason for caution. The long-term trend for housing and auto sales had clearly peaked some years ago for common sense reasons, due to the ageing of the BabyBoomers. The Boomers are no longer buying new houses for the first time, as they are no longer settling down and having children. Nor are they fleeing race riots in the inner cities, and needing cars to drive to the suburbs. Instead, as Dept of Transport data confirms, they are driving fewer miles as they age. The last oil price collapse in 1986 hit Houston, Texas (where I then worked), very badly. Many people lost their jobs and left the state penniless, even posting their house keys back to the bank as the mortgage payment had suddenly become unaffordable. This will likely happen again, right across the oil’/gas belt. In addition, many will have to return their cars, due to the rise in auto leasing. 27% of new car sales last year were leased, not bought, versus 22% in 2012 and just 17% before 2005. But it is hard to maintain the typical $199/month payment if your job has just disappeared. This was the sober report yesterday from the chairman of the authoritative S&P Case-Shiller Home Price Index, adding that “the strongest part of the recovery in home values may be over”. This demographic clearly explains the problems of today’s housing market. The wealthy ageing white BabyBoomers have a similar profile to Europeans. Their children are leaving home, and they are starting to enter retirement. Thus they are not going to provide much support for the housing market. The younger poorer black and Hispanic populations could provide some support, but they can’t afford current price levels. Credit standards have tightened since the subprime era, and few lenders will provide mortgages at multiples of 10x earnings any more. Equally important is that today’s house price to earnings ratios are still too high. They are all 20% higher than average ratios between 1979-99, before the housing bubble began. Declining fertility rates are also having a major impact. Census Bureau data shows there are now only 21m households in the prime 25-34 age group of first time buyers, and just 22m in the 35-44 age group. Whereas there are already 28m households in the 65+ age group, and 23m in the 55-64 cohort. The result is that home ownership rates are already back at 1996 levels, and set to fall further. Demographics are clearly driving the housing market, despite all the efforts of policymakers to turn back the tide. Smart companies will adjust their expectations and strategies accordingly. Housing used to be the key driver for US chemical demand in the SuperCycle, and went into overdrive in the subprime era between 2003-6, when housing starts rose to 2 million/year. We don’t yet have December’s data, but we already know that 2013′s total will be only half this level, despite all policymakers’ efforts to revive the bubble. The blue line on the above chart is a graphic reminder of the madness that occurred. Created by Prof Robert Shiller, probably the leading expert on US housing markets, it shows the amazing bubble that caused prices to double from their long-term average in just 6 years. The best summary of the otulook, as often, comes from Prof Shiller and the latest S&P/Case-Shiller house price report. In discussing the slowdown of prices since the summer they warn that the “monthly numbers show we are living on borrowed time and the boom is fading“. The blog is changing its regular presentation of US house price movements, to mirror that used for auto sales. This should help to identify month-by-month changes. It also means there is no need to use seasonally adjustmed numbers. These are guesswork at the best of times. And in Q1 they have been tested to the limit, due to the abnormally warm weather in most of the US. The blog hopes its new format will help readers to do this.